In a pan, dry toast the peanuts over medium heat for about 4-5 minutes. Transfer to a plate and allow to cool completely. Remove the skin. Repeat the same procedure with sesame seeds and coconut powder until slightly golden (about 2 minutes). Grind the peanuts in a blender or a grinder (I use a coffee grinder that I keep exclusively for my spices). The peanuts should turn into a fine mill, but make sure you stop before it becomes nut butter. Repeat the same procedure with the toasted sesame seeds and coriander seeds. Trim the ends. 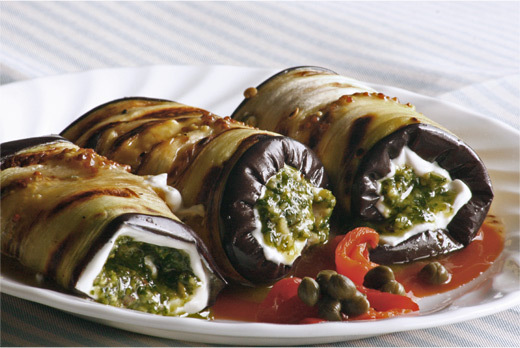 Make a small criss-cross cut at the bottom of the eggplants. Sprinkle the inside with kosher salt and let the eggplants stand for about 30 minutes. Pat dry with a paper towel, removing as much moisture as possible. In a deep small saucepan, heat the oil and fry the eggplants until they soften a bit and are golden. Do not over-cook, as they will finish cooking in the masala sauce. Transfer to a platter lined with paper towels. Prepping the Serrano chiles: Stem, seed and finely chop one of the peppers. 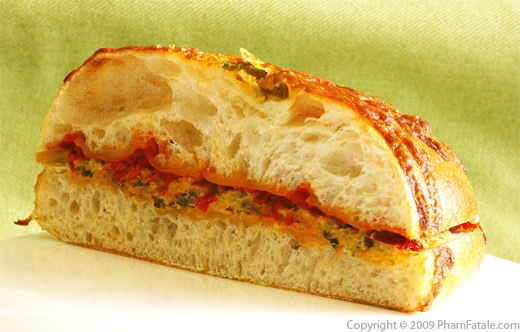 Using a paring knife, create a 2-inch incision in the remaining whole pepper. Note: remember not to rub your eyes after touching the pepper seeds. In a bowl, combine the ground peanuts, coriander, coconut powder, sesame seeds and ¼ teaspoon red chili powder. Add the tamarind paste; it should form a thick paste (add a little water if necessary). 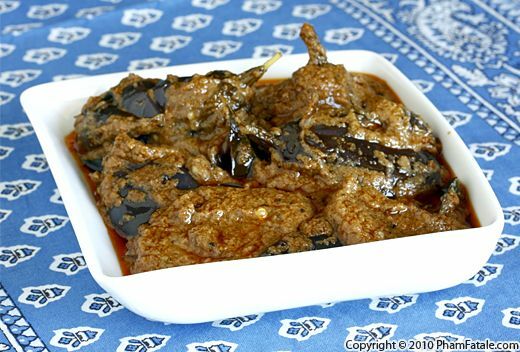 Stuff the inside of each eggplant with a little of the masala paste, reserving a large quantity for the sauce. In a medium-sized deep saucepan, heat the oil. Add the onions. Cook for about 5 minutes until the onions become translucent. Add the ginger garlic paste and whole Serrano peppers to the onions. Stir well. Add the garam masala, turmeric, thick masala paste and a little water (about ¼ to ½ cup). Bring the liquid to a boil, then lower the heat to medium-low and cook for about 8-10 minutes; add more water if necessary (up to 1 cup). Add the eggplants, salt to the masala sauce and bring to a boil. Cover with a lid and cook at a gentle simmer for about 5-8 minutes. 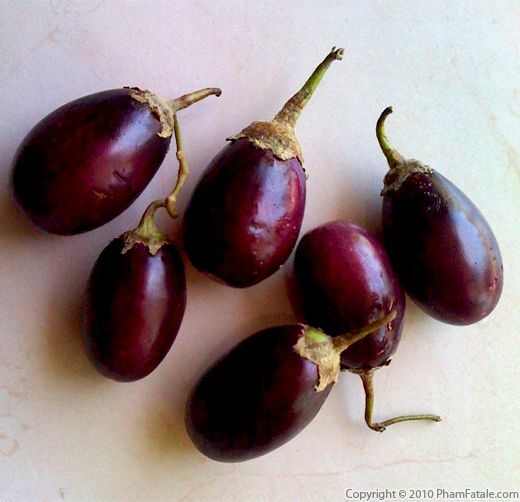 The eggplants should be soft but shouldn't fall apart. Check the seasoning. Add more salt (if necessary) and sugar (if used). Transfer to a serving bowl. This step is called baghar: When you're ready to serve, heat 1 tablespoon of canola oil in a small saucepan (I use a small 0.3-quart saucepan that I use exclusively for baghar). Once the oil is hot, add the whole dried red chiles, cumin and mustard seeds. The cumin seeds will start popping in the hot oil. Add curry leaves, red chili powder and 1 tablespoon of ghee. 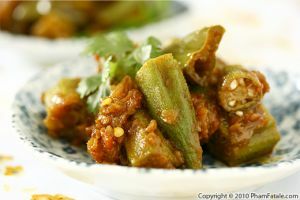 Immediately transfer the hot oil and spices to the bowl of eggplants. Cover the bowl with a lid. Serve warm with roti (Indian flat bread). Eggplants don't store well in the refrigerator, so it's important to cook them as soon as you get them from the market for optimum freshness. 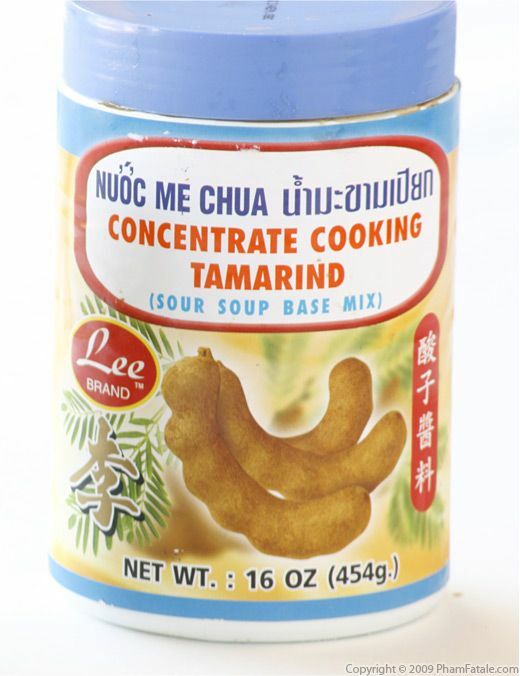 You can find tamarind concentrate in any Asian store. It has a nice tart flavor. You can also use fresh tamarind pods if you like but I find this to be labor intensive. Wash about a pound of tamarind pods, with the skin still on. Boil them in about 4 cups of water for 15 minutes until soft. Drain and discard the liquid. Shell, seed and remove the fibrous membrane. Blend the tamarind pulp with about 1-1/2 cup of water. But as I've said before, I just prefer eating fresh tamarind as is and cooking with tamarind concentrate or tamarind powder. I buy raw peanuts at the Asian store. It's important to pick peanuts with the skin on; that way they don't burn while being dry-toasted. 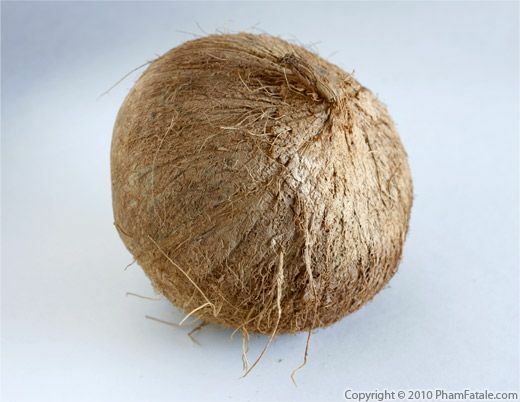 I can find coconut powder in Indian and Asian stores. 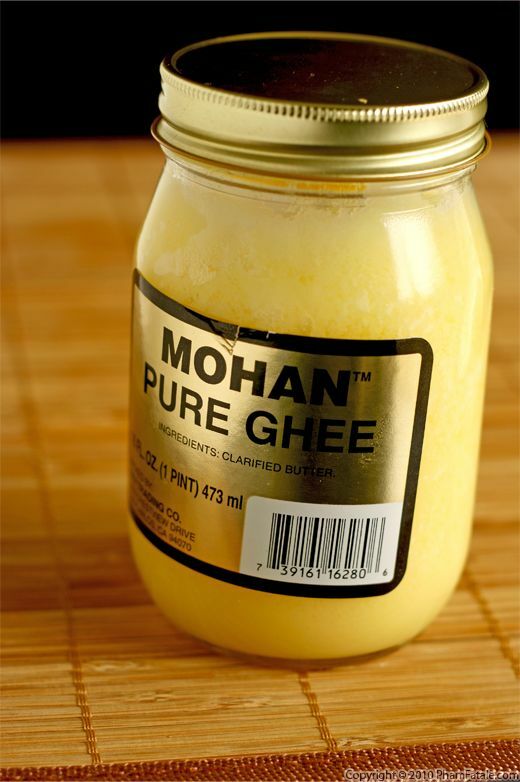 Ghee is the Indian version of clarified butter. You can find it in jars at Indian stores. But if you don't have ghee, you can use butter instead. For a vegan version, just skip the clarified butter or replace it with more oil. Shredded coconut gives a rich, creamy texture to the sauce. I used fresh coconut. First, I opened the coconut using a cleaver. Be very careful if you do. (I usually lay out some newspaper underneath a large wooden cutting board) Then, scrape the coconut flesh using a coconut grater. 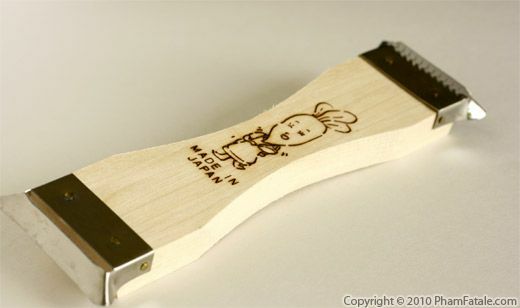 I just bought a coconut grater in a Korean store. I love it! 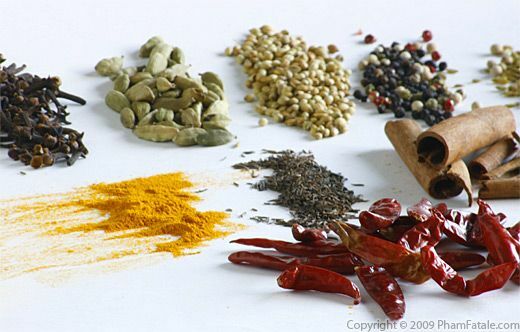 Baghar is a very common step toward the end of cooking in many Indian dishes. I use a small 0.3-quart saucepan that I use exclusively for baghar. 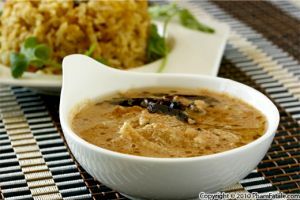 Ginger garlic paste is a very common component in Indian cuisine. If you have extra, just transfer to a jar and store in the refrigerator. You can keep this paste for at least a week in the refrigerator. Don't add too much turmeric! I use it just as a natural food coloring. Published By: Jacqueline Pham on June 15, 2010.